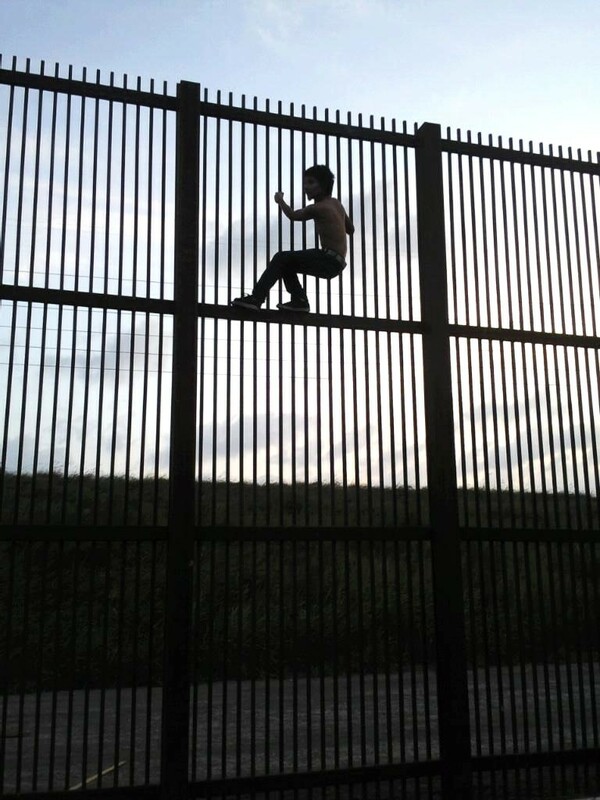 November 2009 Cover: This photograph of a young man scaling the United States/Mexico border fence near Brownsville, Texas, was uploaded to the Internet by a Wikipedia user in July 2009: https://upload.wikimedia.org/wikipedia/commons/7/78/Borderwallbrownsvile.jpg. With the assistance of anonymous individuals throughout the world, Wikimedia Commons increased its online collection from over 3 million to nearly 5.5 million digitized, free use media files since last November's issue of The History Teacher. 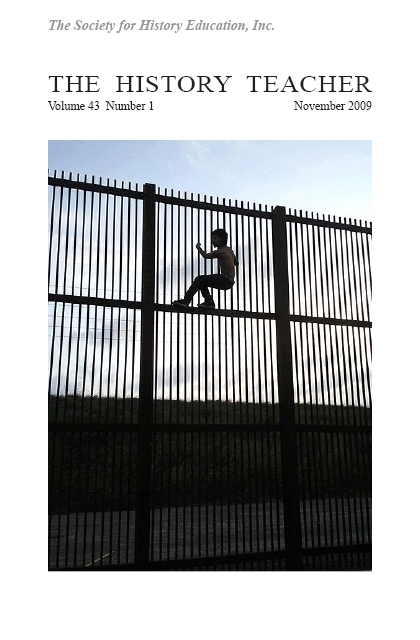 The border fence featured in the picture is a contemporary example of the controversial physical barriers throughout history analyzed by Helmut Langerbein in "Great Blunders? The Great Wall of China, the Berlin Wall, and the Proposed United States/Mexican Border Fence," which begins on page nine of this issue. 52	Organization of American Historians: Interested in the history of the U.S.? Laura Ball is now a junior at the University School of Milwaukee. She attended the National History Day (NHD) competition with individual documentaries in 2006 and 2008. Her first historical paper for NHD became the prize-winning 2009 Senior Division entry. In addition to her historical studies, Laura also enjoys fiction writing and competing on her school's math team. Robert Blackey (Ph.D., New York University, 1968), Professor of History at California State University, San Bernardino, is author/editor of articles and books on history teaching and learning, comparative revolutions, and British history. He has been vice president of the American Historical Association (Teaching Division), a long-time editor of the teaching column in the AHA's Perspectives, and Chief Reader and chair of the Test Development Committee for AP European history. He received the AHA's Eugene Asher Distinguished Teaching Award (2001) and CSU's Wang Family Excellence Award (2003). Currently, he is the only non-arts member of the Steering Committee that is leading the College Board's national Task Force on the Arts in Education. Patricia Cleary is Professor of History at California State University, Long Beach, and author of Elizabeth Murray: A Woman's Pursuit of Independence in Eighteenth-Century America (University of Massachusetts Press, 2000). Dave Neumann is Director of the History Project, based at California State University, Long Beach, and former U.S. history teacher at Wilson Classical High School in Long Beach, California. Peter Conolly-Smith teaches American history at CUNY-Queens College in New York. He has published articles on war, immigration, ethnicity, theater, and film. His book, Translating America: An Immigrant Press Visualizes Popular American Culture, was published by the Smithsonian Press in 2004. He received his Ph.D. in American Studies from Yale University in 1996. Samvit Jain is a student at Redmond Junior High School, where he enjoys researching and writing about historical and contemporary topics. In addition to historical subjects such as ancient history, American involvement in the Vietnam War, and the geopolitical and domestic forces that shaped that conflict, Samvit is interested in mathematics and the sciences, having participated in competitions since fourth grade. Outside of academics, his interests include guitar, piano, painting, traveling, biking, and soccer. Samvit hopes to have a profession as a physicist or an engineer. Helmut Langerbein received his Ph.D. from the University of California at Santa Cruz. He is the Chair of the History Department at the University of Texas at Brownsville and teaches classes in United States, European, and world history. His publications include Hitler's Death Squads: The Logic of Mass Murder and "The Power of Print: The West German Leaflet Propaganda Campaign, 1961-1972." Richard Morris is Professor of History at Lycoming College. He received his Ph.D. from New York University. He has published articles on Revolutionary America in the Journal of Urban History, the Journal of Social History, and the New England Quarterly. Jacqueline Swansinger is a Professor of History at SUNY Fredonia, an institution known for teacher education. Her work in world history teacher preparation dates to 1996, when Fredonia's history department undertook a world history track for social studies. In 2000, she worked as Project Investigator for "Establishing a Teaching Field," an NEH/College Board/World History Association grant to train world history teachers. Recently, she completed 18 months as interim associate vice-president for research and graduate studies.